Come to Feng for Vegan food galore! Miso soup – warm and nutritious; a hug in a mug. Salty or miso edamame – the perfect more-ish snack. Wilted spinach – two tangled heaps of spinach in a lip-smacking creamy sesame dressing. X-Ray Salad – peppers, pomegranate, chives, edamame and avocado with a zingy vinaigrette. Green side salad – fresh leaves, cherry tomatoes, cucumber and edamame with a tasty miso dressing. Nippon ‘Mock’ Duck – Our veggie take on Peking duck with pancakes, cucumber, hoisin sauce and strips of sweet pillowy inari (tofu) in place of duck. Popular with Peking duck aficionados as well as our vegan and veggie clients. Cucumber sushi roll (white or brown rice) – crisp and delicious. Avocado sushi roll (white or brown rice) – creamy and smooth. 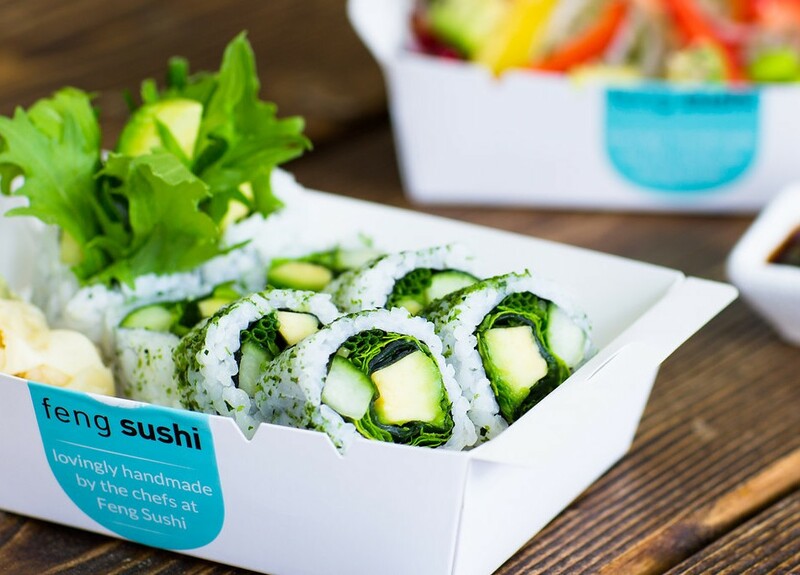 Green goddess sushi roll – seaweed, cucumber, chives and avocado rolled in aonori furikake for additional flavour. Healthy and delicious. We’d love to know what you think of our vegan food so if you have any comments – or any suggestions as to other vegan items you’d like to see on our menu – please email chat@fengsushi.co.uk. To check out our full range of vegan dishes, please click here.